Driving a Trailer takes a great deal of skill. With our 7" Ultimate Trailer Backup Camera, License Plate and Side Cameras, you can enjoy an extra sense of security each time you hit the open road. Simply mount the thin 7” LCD split screen monitor to your dashboard or windshield, adjust the swivel-mounted side cameras to your ideal position, screw the rear-mount camera onto your license plate frame, and you’re good to go! Our ultra durable, waterproof cameras are made of steel and will stand strong during even the most treacherous weather and road conditions. The 120-degree angle of the cameras allow you to see everything in the vicinity of your RV, making it easy to park your vehicle in tight spaces and change lanes. Plus, the compact size ensures you won’t bump it off in tight spaces. Purchase the 7" Ultimate RV Trailer Backup Camera System License Plate and Side Cameras today and enjoy the ability to drive with extra confidence. • Installation takes minutes, with no drilling required for the license plate mount. • Enjoy the unique ability to connect a DVD player or gaming system. 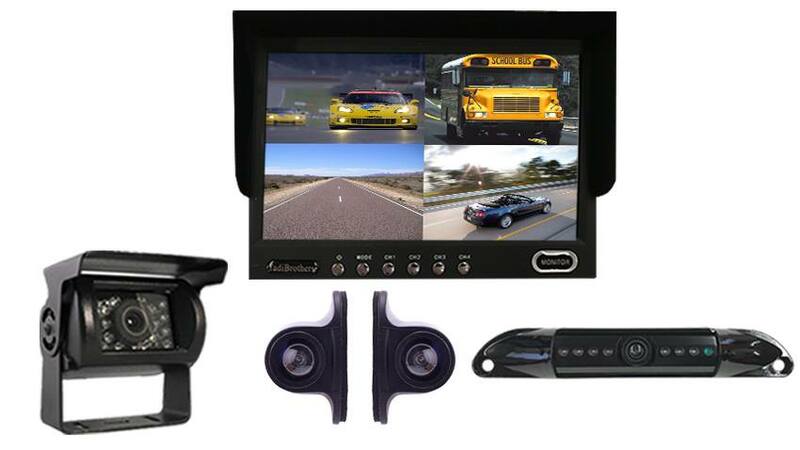 • 120-degree viewable angle and side mirror swivel-mounts let you see everything on the road. • Waterproof 7" Ultimate RV Trailer Backup Camera System License Plate and Side Cameras have full color and auto night vision. • Super durable RV Box Camera can withstand a direct hit from a rock. The License Plate camera is mounted by screwing your current license plate screws through its brackets; it’s a very simple installation. The camera can also be adjusted by angling the camera up or down so you can get the perfect view for your car. The CCD lens is the clearest and highest quality camera TadiBrothers sells. There is no need to drill any holes or install mounting brackets. The camera has a 120° angle which is best for Cars, SUVs, and Trucks. With 120° everything behind the vehicle can easily be seen, it is also color, waterproof and has military grade night vision. The camera and mount are made of steel for ultimate durability in the roughest weather conditions. The side camera has a 120° Degree viewable angle, its waterproof and has auto night vision. The side camera is perfect for any long RV or Bus. You can mount it on the side facing front or back any see everything in crystal clear quality. You need help parking? This is for you! You need help changing lanes on the freeway? This is a must! The RV Box camera Has a 120° Degree viewable angle, its waterproof and has auto night vision. The camera is one of the most durable we have, with incredible adjustability and night vision clarity. The RV Box camera has a metal sun shield visor to protect you from glare and pebbles. This is by far our toughest built camera. It has been regularly used in cars, vans, buses and even industrial sized caterpillar trucks, operated in the harsh oil sand of Canada. This camera can take a direct hit from a rock and it will still work like new. It has also been very popular with RVs, because its housing allows you to install the cameras on multiple sides of your RV. FOR THOSE OF YOU WHO WANT MORE! You can also add a FRONTAL camera and make it a 4 camera system! "I had previously had a single camera on the rear of my motor home, after having issues with the blind spots it was only necessary that we needed side view cameras because we were having some close calls when making lane changes, after help installing this from your tech support team, I no longer have that issue, great product and thank you for your help setting it up -Mark"
" Item as described, kept informed after purchase, shipped quickly, Thanks"
"I like the spitting. I wanted 2 spec cams at a time and then when parking 3 of them. I can mix them up. Cool"
"I changed it up to a larger 7" from 5". Its good for a split. I would like 9" but I think 7 works for me. They helped with questions and links."